If your pole breaks during a pole vault, do you get a do-over? 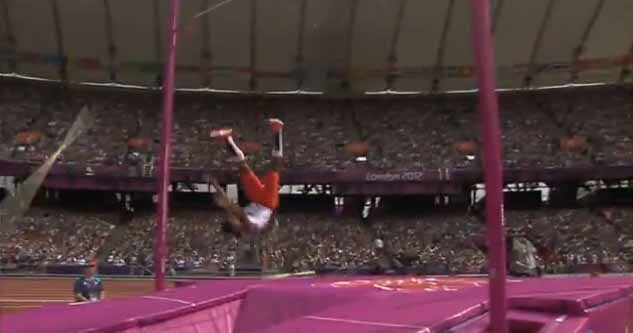 Cuban pole vaulter Lazaro Borges, falling. I missed Cuban pole vaulter Lazaro Borges&apos; dramatic fall yesterday, but thanks to the magic of technology and our tendency as a society to enjoy watching people mess up, I&apos;ve had many opportunities to watch it today. But the one question I had that was more difficult to find the answer to than you might think was: if your pole breaks during the Olympics (or really, any time during competition), do you get to try again? According to Wikipedia (yes, I know) "If the pole breaks during the execution of a vault, it is considered an equipment failure and is ruled a non-jump, neither a make nor a miss [emphasis ours]. Other types of equipment failure include the standards slipping down or the wind dislodging the bar when no contact was made by the vaulter." "Each athlete has a set amount of time in which to make an attempt. The amount of time varies by level of competition and the number of vaulters remaining. If the vaulter fails to begin an attempt within this time, the vaulter is charged with a time foul and the attempt is a miss." Interestingly enough, The Daily Mail points out that, "There is also no standard size to the poles, which are among the least-regulated of any Olympic apparatus. They are instead developed to take into consideration the vaulter&apos;s maximum weight." So I guess, yes you get to make another try but you still have only a certain amount of time to make your attempts and you&apos;re running out of that time? Who used to pole vault and knows about these things?